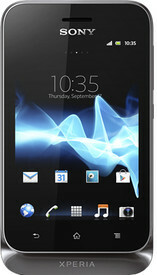 Sony’s flagship Sony Xperia series comes out with its latest offering, the Sony Xperia Tipo Dual. This Sony Xperia mobile comes in a bar form and is powered by an 800 MHz Scorpion processor. The phone is run on the smart and clever Android v4.0 (Ice Cream Sandwich) OS and also contains 512 MB of RAM to ensure the smooth running of multiple applications on the device. The phone features a 3.2-inch TFT Capacitive Touchscreen which provides an HVGA resolution of 320 x 480 pixels. The phone also comes with the Timescape user interface which serves to enhance the usability of the device. The Sony Xperia Tipo Dual has a dual SIM (GSM + GSM) capability for users who require separate SIM cards for different network providers. Additionally, the phone features an Adreno 200 graphics processing unit which serve to enhance the visual experience for the user. The phone features a 3.2 megapixel camera which is capable of recording video at 640 x 480 pixels as well. The camera features a 4x digital zoom in addition to other useful features like Geo-tagging, send to web and Self Timer. The Sony Xperia Tipo Dual is a sleek and smart looking device and comes in dimensions of 57 x 103 x 13 mm. The phone weighs in at a lithe 99.4 g and features useful display features like scratch resistance, handwriting recognition, gesture support and multi touch. The phone also contains an accelerometer sensor, proximity sensor and compass to boost the ease of use of the device. The Sony Xperia Tipo Dual is powered by an adequate 1500 mAh Li-Ion battery which promises the user atalktime of up to 5 hours when used on the 2G network. On the 3G network, the phone gives a talktime of up to 6 hours. This Sony Xperia mobile possesses an internal memory of 2.5 GB and can be expanded by up to 32 GB using micro SD card, thus giving you enough space to store your music and video collection. The phone is capable of keeping the user connected to the internet via the multiple features it possesses. The device comes with GPRS and EDGE technology which will keep you connected via the 2G network. The phone also comes with HSDPA and HSUPA technology to keep you connected to the 3G network at a faster browsing speed. Files and documents can be exchanged using the Bluetooth functionality or the micro USB port in the phone. The WiFi capability of the device allows the user to connect to wireless network in the vicinity. The WiFi hotspot and micro USB port allows the user to tether their phone with another device as well. Additionally, this Sony Xperia phone also acts as a navigation aid in the form of Google maps which uses assisted-GPS technology. The phone is capable of keeping you entertained through the multiple features it comes with. The music player, video player and FM radio features can keep you entertained on the move. Sound enhancements in the form of xLOUD Audio Filter technology and TrackID music recognition make the usability of the multimedia functions highly desirable.